Potions and tasty dishes are created by processing the yield from animals and plants in one of the new farming buildings. 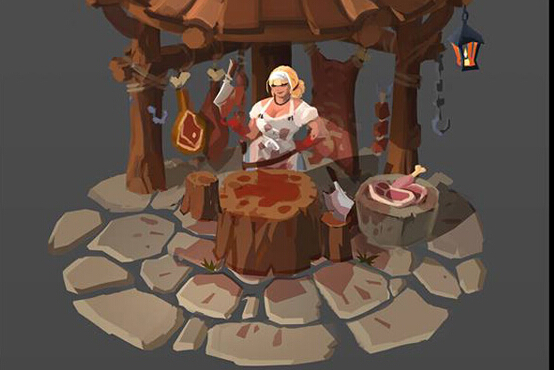 In the mill, players can turn their harvested grain into flour, the butcher will strip animal carcasses for their meat, the alchemist is an expert at brewing powerful potions, and the cook will bake irresistibly tasty treats from the ingredients the player brings them. Whole dishes such as meat pies, cake, carrot soup and mutton kebabs will give the player strength and help them to recover after battle. Alchemists’ potions can help to boost a player’s chances during battles, but have a cooldown period, so use them wisely. Becoming a hero in Albion Online can really take it out of you. Alongside monsters and wild beasts, which pose a constant threat in the wilderness, other players have got their eyes on your hard-earned weapons and resources – and your life. However, the new farming system is set to offer players a way to relax away from the battlefield, providing a useful and fun alternative to PvP action. Working the land, players have the ability to create various foodstuffs and potions which bring a number of different buffs. Developers Sandbox Interactive are providing new land types and buildings, including pastures for grazing livestock, and farms for working crops, so that players can get the most out of their land. Farming in Albion Online encompasses both the raising of crops of vegetables and grains as well as the rearing of livestock. Players can grow tomatoes, potatoes, corn or pumpkins by sowing seeds on their farms. When the time is ripe, the yield from the plants can be used as ingredients in various foods and potions, or as fodder for livestock. To grow from a tiny whelp to a worthy bull, an animal needs to be fed and fattened up. Players can rear goats, chickens and cows, amongst others, and these can then be slaughtered for their tasty meat. Players shouldn’t deliver the final blow too soon, though, as animals will also produce other useful consumables such as eggs and milk throughout their lives. These goods can either be consumed straight away as they are, or mixed and cooked into, for example, a delicious cake.